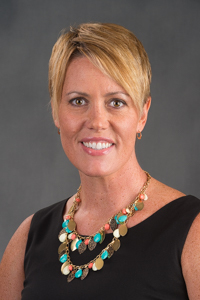 BLOOMINGTON, Ill.— Illinois Wesleyan University Assistant Professor of Nursing Amanda Hopkins has been selected for the 40 Under 40 Emerging Nurse Leaders award. Hopkins is among the first-ever recipients of the 40 Under 40 Awards, sponsored by the Illinois Nurses Foundation and the Illinois Healthcare Action Coalition. The award honors 40 Illinois nurses under the age of 40 who have demonstrated dedicated service to the population, encouraged dedication to the nursing profession and indicate leadership growth promise for the advancement of nursing in Illinois. Hopkins received a doctorate in nursing from the University of Illinois Chicago. She has expertise in caring for children with chronic conditions and their families as a pediatric nurse and nurse educator. Prior to joining the faculty at Illinois Wesleyan in 2013, Hopkins taught several undergraduate and graduate nursing courses at the University of Illinois at Chicago College of Nursing, Urbana Regional Program. Hopkins’ research has focused on mothers’ perceptions of the management of their children’s chronic condition, specifically sickle cell disease and cystic fibrosis, within the context of the school setting. She has published multiple manuscripts and chapter case studies, and has given numerous professional presentations. She is a member of nursing honor society Sigma Theta Tau International, Midwest Nursing Research Society, and the International Family Nursing Association.